Let's give a hearty welcome to a new guest reviewer, Arinjoy Mitra - take it away, Arinjoy! Heartiest thanks to Michael for giving me this opportunity. This is a great time to mention that the DX01 Joker review in this site got me into the 1/6 world I am in now. Thanks again Michael. 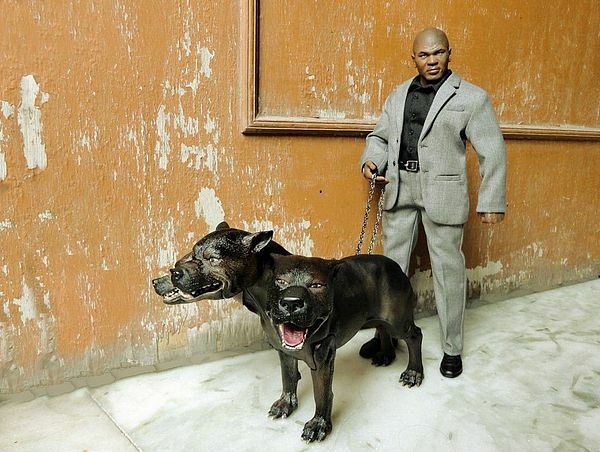 Throughout his career, Tyson became well known for his ferocious and intimidating boxing style as well as his controversial behavior both inside and outside the ring. Tyson is considered to have been one of the best heavyweight boxers of all time. He can be considered the one to give Boxing the ferocious look that we know of. 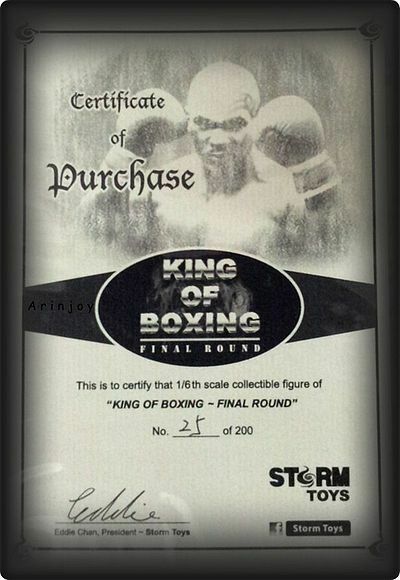 Storm toys decided to make a collectible resembling the King of Boxing (Dream come true for Tyson fans like me) and named it….. Well you guessed “The king of Boxing”. 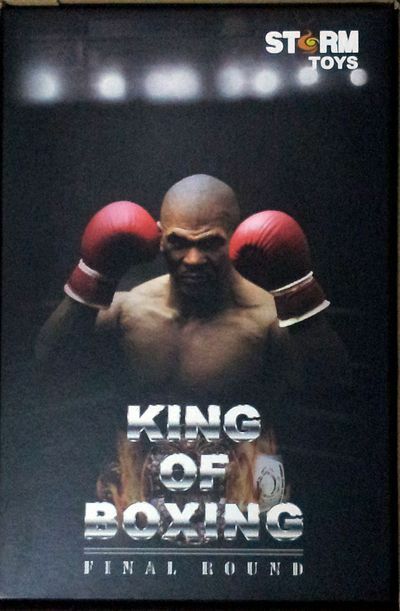 The version I am reviewing today is the second one, called The King Of Boxing Final Round. The King of Boxing comes in a very basic shoe box design package. Very simple yet very collector friendly. On the outside you see the pictures of the actual product and not the actual person; it doesn’t surprise me considering that this is not a licenced product. The whole black design does appeal to me as it looks classy and mean at the same time. One you open the box you see a foam layer. 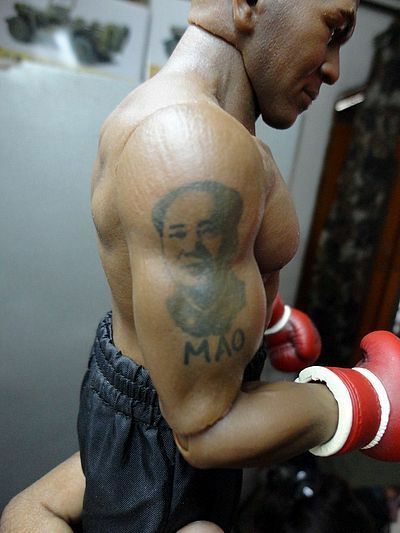 Under it is the king, wearing boxing shorts (and black underpants underneath) showing of his years of training on his iron packed body, bare footed and bare chested. Alongside him you have the additional head and 3 additional hands. Under this one there’s another foam layer containing the formal suit, two pairs of shoes and the boxing gloves. All keeps really safe (until the customs guy starts playing with your stuff, like they did to mine I guess). All and all really good packaging for a smaller and newer company but could have been better. This is an unlicensed product, which means this can be anybody. This can be Denzel Washington, Ronnie Coleman or Will Smith, who knows. 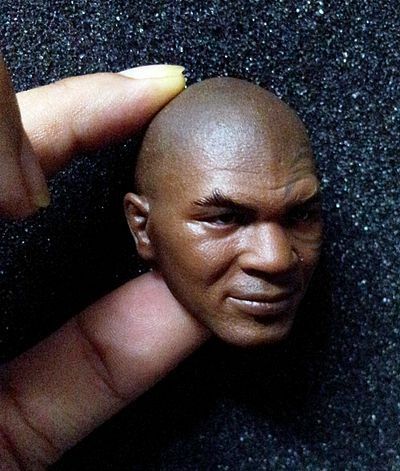 But I am giving this sculpt full points considering that he looks like the actual King of Boxing , Mike Tyson. There are two sculpts, with two different expressions, and both outstanding. One has an intense look, very soon to be ferocious, and the other looks like the lighter side of Tyson, the one we saw in Hangover etc. The sculpts look as real as they can with the inmost details like the smallest of skin pores on his forehead and the stitch marks on his temple are masterfully replicated. Stormtoys do not mention the names of their sculptors anywhere in the box etc, but I salute them for the sculpts. If Stormtoys is giving us these start up products with this kind of a paint application, the future for this company is very bright. The skin tone on the heads and the body is even and really looks like an afro American skin type. I had a little apprehensions with the eyes of the prototype as they were flat white, but the actual product is way too human with the right amount of shine in them. There is no seem in the hair line but the slight colour of hair makes the shaved head look shaved and not just marble clean bald. The eyebrows and the moustache (on the angry head) are sharply done. 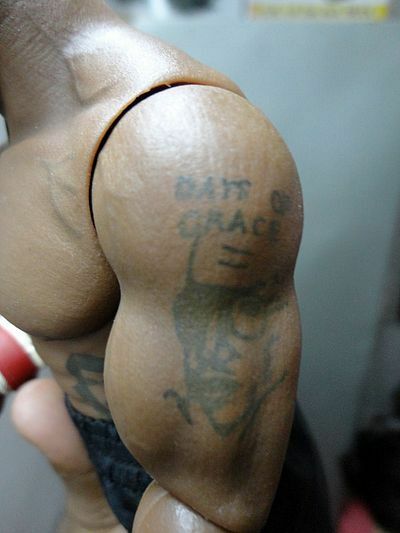 The tattoos over the body are very well made with the actual greenish tattoo colour. All very real and believable. So what do you expect from a company which is as small as to produce only 200 pieces worldwide. A good head sculpt to market their product, an out of the shelf Afro American muscle body, descent clothing and some good accessories. Well, that’s not storm toys. 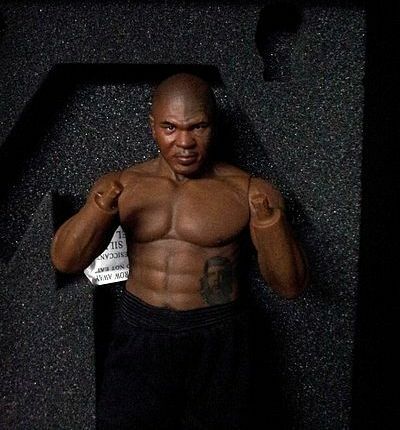 They have done this before with KOB and they have done this again with KOB final round, a newly sculpted body based on the timeline of the product each time, this time it seems to be based on Mike Tyson in around 2005. It is really hard to expect a company this new to produce a different body to represent the same character at different times of his life. This body has all new peg designs (which mostly and unfortunately are incompatible with most of the 1/6 figures, except the head) and if I have counted correctly, its 20 points of articulation. The hand peg is a part of the forearm and is made of softer rubber like the rest of the body, which means, you cannot take out the peg. So in case you break it, cut it, damage it in any ways, then say your happiness goodbye. The foot pegs have a different kind of head on the end which attaches to the legs, but a compatible head towards the shoes/feet. The body is made of a high quality PVC Resin (as per Stormtoys), so it’s soft as the Leonidas body, but not the same material. The elbows are single jointed but are a lot more bendable than the HT T800 body, even though KOB also has muscle arms. 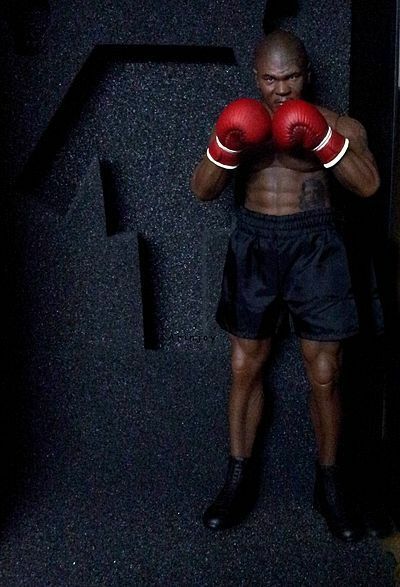 The knees are again single joints but that makes them look cleaner than a truetype, and that is actually required for a boxer who might be posed wearing Shorts. The shoulders move front back and sideways. The waist can twist but no AB crunches possible. 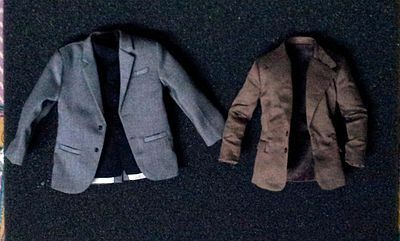 The hand pegs start at a little higher than the wrists, like the older Enterbay BL bodies. The hands also have an additional joint just between the fingers and the wrist. The neck is ball jointed. The muscle texture and definition are amazing. I really hope Stormtoys come up with more compatible bodies in the future. I am deducting half a point just for the compatibility factor. 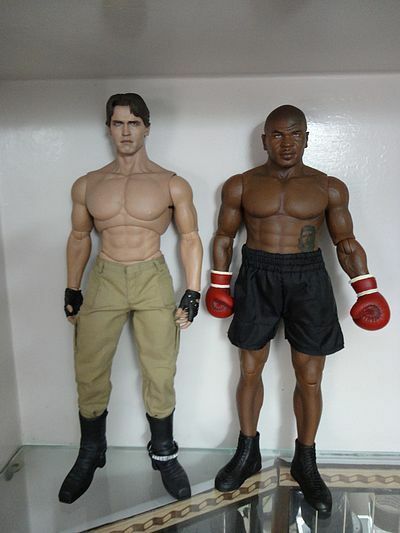 If you want to call the additional smiling head and the boxing gloves as accessories, then that’s your call, but they are a bit too few for a $220 figure. I have already spoken of the head sculpts; the gloves are well sculpted but would have loved to see EVERLAST written on them. But again…… unlicensed figure. But c’mon, that’s it…. Not even a stand. I would have at least expected a championship belt. Like I said, he comes wearing boxing shorts with underpants. The underpants are black with shiny and broad elastic at the waist. The boxing shorts are really nice, made of shiny and synthetic fibre stuff. It looks as close to real as possible. He comes with two pair of shoes, one resembling Everlast leather boxing shoes, and the other are formal black shoes with black socks intact. Now there’s the formal Suit. I am really amazed to see the suit. 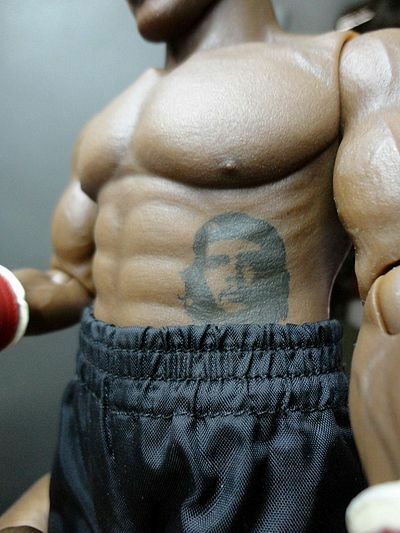 It is Huge, a comfort fit for the big Tyson body. It looks really crisp and expensive with super sharp stitching and ironing. All the pockets are working and the blazer inner lining very well done. He also has a black shirt which is again made of a very nice fabric and looks great. I have added a pic to compare the size of Tyson blazer to that of HT Bruce lee in suit. I am for sure going to display him in his Suit. It is expensive, no doubt. But what makes a collectible a Limited Edition Collectible is to know that its just 200 worldwide, so only 200 or less guys have it around the world. What a feeling. I gave it an additional star for this. 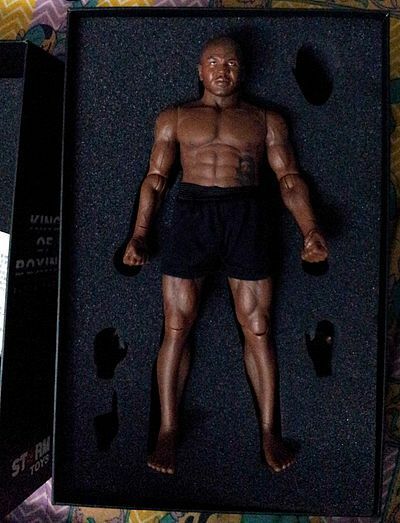 For a collector my age and a Mike Tyson fan, this is just great for display. Yeah, display is what means fun to us now days , and may be a little bit of playing… Ahem… posing. Don’t give it to anyone to play, as this is one 200 that you’ve got and this can be proved with the Certificate you get. (Yes, you do get a limited edition certificate (Mine are number 24 and 24 out of 200). Take really good care of the figure, once damaged, there no more available. Great in all aspects like sculpt, paint, body, clothing, value except of the accessories. Everything is done with exceptional quality making me hungry for more from Stormtoys. This product was purchased for the review by the reviewer. Photos and text by Arinjoy Mitra.